gured as combination refrigerator-freezers, too. Pass-through reach-ins allow access from both sides. Glass-front reach-ins offer easy identification of contents and are suitable for grab and go and merchandising displays. 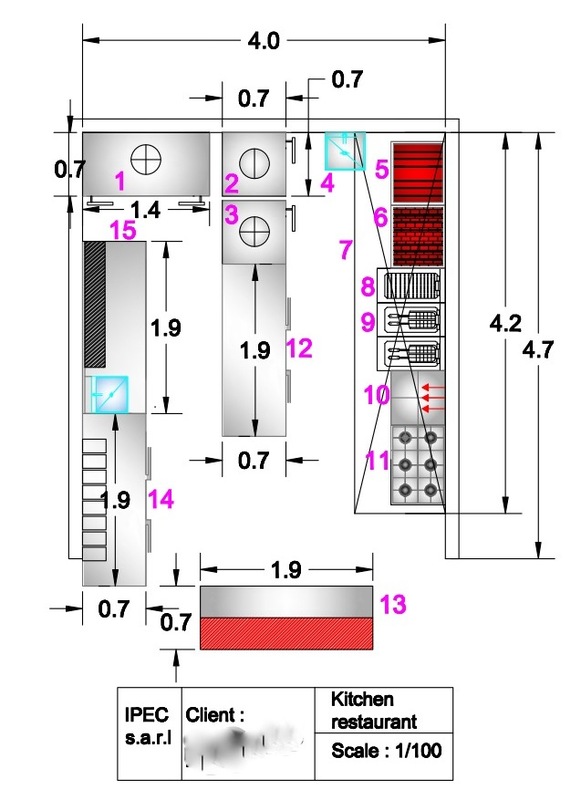 Capacities/Footprints: Depending on the number of doors, reach-in units range from 18 to 57 inches wide, 29 to 36 inches deep, and from 78 to 84 inches high. Storage capacity can range from 16 to 80 cu. ft., depending on the number of doors and other factors such as the placement of lights and other key components. Energy Source(s): Reach-in refrigerators typically operate on 115 volts of electrical power. 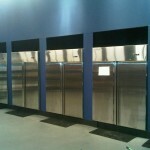 Most smaller one- and two-door reach-in freezers use 115 volts as well, but three-door freezers may use 208 to 230 volts. Standard Features: Top-end reach-in units are typically manufactured of aluminum and stainless steel in a variety of combinations. Reach-ins generally utilize 20 to 30 lbs. of rigid or foamed-in-place polyurethane insulation to help maintain interior temperatures. 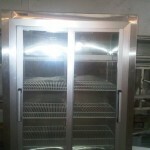 At the minimum, reach-in refrigerators are manufactured to maintain an interior temperature of 40 degrees F or below, while reach-in freezers should be able to maintain interior temperatures around 0 degrees F. Some freezers can reach temperatures as low as -20 degrees F.
While a one-door unit typically requires only a single compressor up to ½-horsepower, a two-door unit may need a ¾-horsepower compressor and a three-door unit requires up to a 1-horsepower compressor. Compressors are typically mounted on the top or bottom of the unit. Almost any reach-in can be fitted with either one full-door or two half-doors. Standard features include interior lighting; shelving; legs or casters; external thermometers; automatic condensate evaporation; and magnetic gaskets and locks. New Features/Technology/Options: Newer models have a microprocessor temperature control that helps maintain temperatures. Airflow systems potentially keep units from working as hard to recover after doors are opened. Legs can be installed on units in lieu of casters. Other options include digital or dial thermometers; temperature monitoring and alarms; epoxy-coated, chrome-plated or stainless steel shelves; pan slides; fluorescent lights; LED lighting and advanced electronic controls. Many utilities also offer rebates toward the purchase of qualified products. Key Kitchen Applications: Reach-ins are essential for holding foods safely and keeping them easily accessible in storage, prep and service areas. Purchasing Guidelines: The size of a facility, style of food preparation and production demand levels will help determine the operation’s requirements for refrigeration. The decision whether to use tray slides or standard shelving also depends on the application of the unit. Also take into consideration cabinet electrical power requirements and available supply. 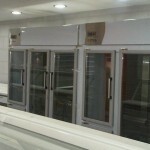 There also needs to be adequate ventilation to exhaust the refrigeration system’s heat. Half doors can help reduce air exchange and minimize intrusion into aisle ways, which can disrupt work flow. Maintenance Requirements: Each week, thoroughly clean cabinets using simple soap and water. Avoid using caustic cleaning material. Clean condenser coils regularly — the exact frequency of the cleanings will depend on the surroundings. In some cases, weekly cleanings will be necessary. Regularly check the gaskets to ensure a proper seal forms around the door. Specifying a unit with heavy-duty casters makes it easier for staff to move it and clean behind. Energy Efficiency: Depending on the municipality, some units are eligible for rebates from various utility companies and other governing bodies. Food Safety and Sanitation Essentials: Reach-ins must hold foods consistently at 40 degrees F or below, as specified by HACCP requirements, and must be able to recover temperatures quickly. Ensure that the refrigeration system is adequately sized for the amount and type of product as well as usage. El Bulli Chefs in Beirut to cook in IPEC Kitchen Lebanon. Oct 4th Beirut, Lebanon – Nobrand Holdings and Beirut Restaurants declare the first annual El Bulli Gastronomic Week a resounding success. The groundbreaking event which took place from Sept 29th – October 1st featured three of the Middle East’s rising culinary stars in an event masterminded by Nobrand Agency Creative Director Badeeh Abla. Beirutrestaurant.com’s El Bulli Gastronomic Week delved into the culinary genius of Ferran Adria – whose Barcelona based restaurant topped the list of the world’s best for over a decade. The menu, presented at Nobrand Holding’s historic Blue House over four days, consisted of a chef’s tasting, prepared by the El Bulli resident chefs, with wine pairing for each course. Guests included former Miss Universe Georgina Rizk, Senator Doghmoch, the Spanish ambassador, Nayla and Nicolas Audi, Carine des Plates, Karim Karagulla, Mark Timbrell, the Netherlands’ counselor and many other esteemed guests. The world famous El Bulli Nitrogen frozen Mojito, the world debut of “Lebanese Tempura Fig Birds” served with a mouth-watering consommé, the CNN featured Morels with Egg Yolk, Gin Fizz, Olive Spheres, Oysters, Cherry Gazpacho with Shrimp & Chlorophyll, Thai Lamb Sous Vide, and Soft Gelled Coffee with White Chocolate & Caramel. “This is the first in a series of events created with the intention of elevating Beirut’s status as the culinary hub of the region. We’ve reached out to some of the world’s greatest chefs and been gratified to hear they’re excited to showcase their talents in Lebanon,” says Nobrand Creative Director Badeeh Abla. Lady Cochrane’s historic Gemmayze “Blue House” is a testament to the indisputable allure of one of the Middle East’s most enchanting destinations. As re-imagined by Nobrand Holding Creative Director Badeeh Abla, this hidden old world gem blossoms into a bohemian hideaway with clear aristocratic charms. The journey begins on unassuming paved road in the heart of Rue Gouraud, leading you through a secret garden adorned with a lush Frieda Khalo-esque palette. The Lebanese brick exterior gives way to a Grecian inspired interior with embroidered wood accents as you make your way up the Basil stairs to the Jasmin Room. The Blue House hosts a design studio and features a private kitchen equipped by IPEC kitchen Lebanon tailored to the needs of internationally renowned top chefs. The Kitchen includes a PIRON convection Oven, SOUTHBEND four burners range, Pitco fryer, stainless steel tables, cupboards, shelves, refrigerators, sinks, cold room. 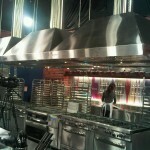 The whole range of stainless steel kitchen equipment -Lebanon made- is manufactured by IPEC factory. 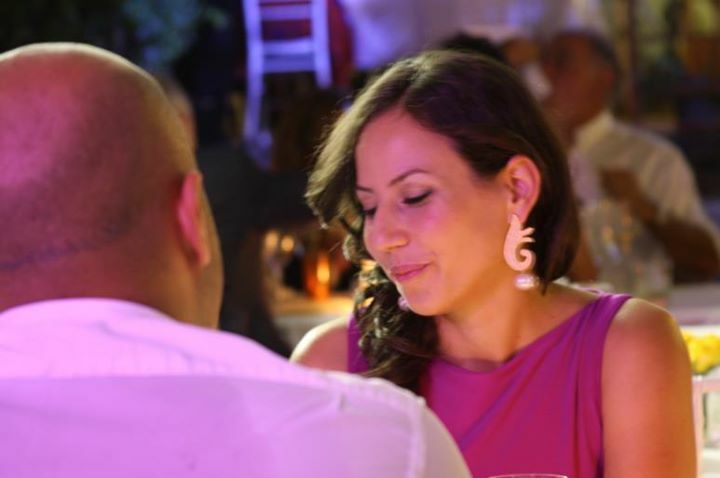 The brainchild of online branding guru Badeeh Abla, Beirutrestaurants.com has become Lebanon’s number 1 online portal for all food related enquiries and news. Boasting over 1600 restaurants, daily updates, and 2000 hits per day, Beirutrestaurants.com has firmly established itself as the country’s go to resource for all F&B related news including: chef interviews, social calendars and restaurant reviews, providing diners, tourists, and restaurateurs with an online resource to compare notes and share insight.